Home Toolkit Business Basics What is a Fashion Tech Pack and why do you need one? What is a Fashion Tech Pack and why do you need one? No matter how amazing your fashion product design may be, without a Fashion Tech Pack, and with no experience or knowledge of the industry, most factories will not take you seriously, agree to deal with you or if they do, you will face countless problems. And yet so few fashion entrepreneurs know about it or know how to put one together. While in my final year at fashion school, I designed a product called a Jac Sac. I made the pattern and a couple of samples myself and had the brilliant idea to sell it to the public. After setting up a photoshoot with my friends, I cobbled together a Lookbook. Then I made calls to buyers and the press and set up some appointments. I received a lot of press coverage and orders were placed by some great shops, including Paul Smith, Duffer of St George and a couple of boutiques in Japan. Thinking back, this all sounds easy. I was certainly lucky to get as far as I did, but one of my great strengths was that I knew how to make a pattern and to sew. You see, producing an order of 30 identical items is very different from making a couple of samples. Admittedly, I created the Paul Smith order on my mum’s domestic sewing machine, such was my determination! But it’s not always possible to ‘do-it-yourself,’ particularly if you’re a complete novice who wakes up one morning with a lightbulb moment, but no idea of where, how or what needs to be done to get this amazing idea off the ground. You’ll probably have to trust a manufacturer with your vision, but how can you accurately convey your ideas, guarantee you’ll always be on the same page, and the samples or products you end up with will be exactly what you want? As a student designer, this was one essential skill that I didn’t know anything about. I do now. What is a Fashion Tech Pack? Simply put, a Fashion Tech Pack or Spec pack, is an information package that, in the first instance, is sent out to factories to acquire pricing for making your samples. Once you have selected your factory they will use the pack as a blueprint for your sample production, as it contains all the necessary components required to manufacture it. With this essential tool to hand, and after your samples have been approved, you could move your production to any factory anywhere you want. You could use your Fashion Tech Pack as a resource document for purchasing materials and trims, and in future years you could refer to it and revisit a vintage design. It also puts you in a position of financial security. If the factory chooses to ignore any of the information in the pack, and do their own thing, they will be at fault. In the event that this should occur, you will be in a stronger position to ask for your money back or to seek legal aid. The Fashion Tech Pack is the key to realising your vision. As you produce your products, you might consult with a machinist and pattern maker, and at times a technical designer. The information included in the Fashion Tech Pack will change and develop following fit meetings and product development. 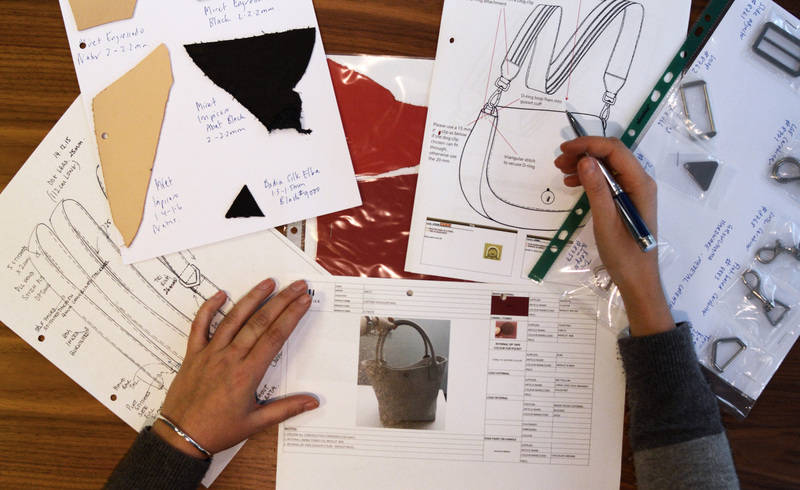 Your Tech Pack notes will help the factory to produce accurate, well-fitted garments. As the designer, you produce the Fashion Tech Pack – the more detail within means there is less room for error and inefficiency. It is completely under your control. You could think of it as your Product Bible. Let’s take a look at what’s inside. What will you need to create a Tech Pack? 1) Technical drawings: A clean line drawing of the garment with a front and back view. 2) Reference materials: Magazine images referencing finishes and details that you would like on your products. 4) Packaging information: How are the products to be packaged, i.e. in cellophane bags or boxes? 5) A Pattern*: A professional pattern of the garment with all relevant information included on it. The factory sometimes offers a pattern-making service, or you will have to source a pattern cutter. SKETCH: front and back line drawing with the measurement details for the garment. Drawn by hand or computer. MEASUREMENT CHART: This will contain the various size measurements of the required item. 7) Comments: Notes taken while reviewing a sample for approval. These should be included in the Fashion Tech Pack. Remember to include the dates. This way you can easily track changes that you have made and can share them with the factory. MATERIAL DETAILS: Swatches, product code, fibre content and supplier details. MEASUREMENT CHART*: This will contain the various size measurements of the required item. It will be used to check that the measurements are correct on the finished garment. PRINT INSTRUCTIONS* Information regarding the type of print on the product and its placement. EMBROIDERY INSTRUCTIONS*: Pertaining to the type of embroidery, its size and placement. STITCH INSTRUCTIONS: In reference to stitch type, thread to be used and stitch length. CARE INSTRUCTIONS*: In reference to washing finishes for items such as denim garments. ACCESSORIES INSTRUCTIONS: Trim details – Fastenings required with product codes, fibre content and supplier details. LABEL INSTRUCTIONS: Placement details for brand logo labels and care labels. COMMENTS SECTION: Used by the factory to make a note of anything related to the product construction. (* Denotes items which are very important when preparing a garment Tech Pack). What are the benefits of Spec Sheet? There are many benefits of a Spec Sheet, and in my experience, it pays to do this properly. Helps factories to save time in selecting/contacting suppliers of fabrics and trims. Enables the costing process to be more efficient. Can be used to create a pattern if made in the factory. To provide PoMs (points of measure) to be used to check measurements against the finished garment. Prevents mistakes being made in the sampling process. So, is the Fashion Tech Pack an absolute essential for successful communication and fashion design? Yes. Yes. YES!!! You’ll have credibility with manufacturers, and have a clear overview of what you’re creating and how it’s developing. There are far too many variables for you to keep track of. Remember, all of this information is needed for EACH product that you create. It’s obvious that you’ll need to work carefully and methodically to put it all together in a style that works for you, and you may even need to call in a few favours. The resources below will guide you in your efforts. If you’re confused between a Fashion Tech pack and Specification sheet then just know that Spec sheet forms a part of Tech Pack. For a better understanding, read here. The manufacturing side of the fashion industry can be a minefield to the novice designer. With so much information required in a Fashion Tech Pack, it’s probably a good idea to make tech your friend and embrace it wholeheartedly. In the first instance ensure that your data systems are up to date. In the past, it was difficult to find factories easily. While there are now plenty of choices, it’s important to select responsible manufacturers that are right for your product and business. Good ethics and working conditions, with a commitment to the environment and human rights, are so important. While not all factories can meet all requirements and have the paper to prove it, it is worth enquiring and checking on their compliance. This way there won’t be any surprises at a later date. Entrepreneurs in fashion push the global fashion industry forward through new business models and product innovation. Unfortunately, finding manufacturers to accommodate smaller production runs is a challenge faced by many. Research the best places to source production of your particular requirements, and always be on the lookout for new sources. When you find great suppliers, let them know you appreciate them! Make them part of your business and regularly update them about your plans. Websites that facilitate manufacturing search include Makers Row for USA manufacturing, and Make It British for British manufacture. And of course, for wider global searches there is our platform, Utelier. Our own tool, specially created to help designers – SPEC is a fabulous resource that will enable you to create the Fashion Tech Pack. By using Excel to create your Spec Sheets, you can record information relating to the style, such as grading, measurements, fabric, trims and fit comments. There are also plenty of downloadable templates available on the internet. Drawings can be created in Adobe Illustrator. Or if drawing flats is a little too technical, find someone to help you on freelance platforms like PeoplePerHour. Take photographs of relevant changes to samples, at fit meetings, and upload to your computer. Include them in your documents and annotate. Dropbox is wonderful for sharing and keeping larger files with manufacturers. I can imagine how frustrating it would be communicating with overseas factories, but it’s unnecessary to employ a linguist when Google translator is available. Some factories ask for deposits prior to commencing the project. Keep on top of things by using Paypal. Compiling a Technical Package (otherwise known as a Fashion Tech Pack or SPEC Pack) for your design idea(s) will be the key to unlocking the door to that mysterious fashion world you want to enter. Without one, and as someone with no experience or knowledge of the industry, factories will not deal with you and you will face many problems. For instance, you could assume that the factory can read your mind and understands your brand, vision or style. That they can look at your drawings and listen to your descriptions and choose the correct sewing thread colour, decide on the number of stitches used per inch, figure out pocket placement, and source your materials. That they can figure out the cost of your samples. But it doesn’t work like this. In reality, you will need to make all of the decisions related to how you would like your garment to look. Without this information, you’re likely to receive ill-fitting, badly made garments, and have to pay again to have them remade. I still shudder when I think about the problems I faced and expensive mistakes I made as a fledgeling designer with no knowledge of what a Fashion Tech Pack was, or does. To get started documenting your ideas, sign up to SPEC. If you want a Spec Sheet checklist to help you ensure you have covered all important points, get your free copy here.